The three IACC yachts purchased by Peter Harrison’s GBR Challenge for the British entry in the next America’s Cup have arrived in Southampton. 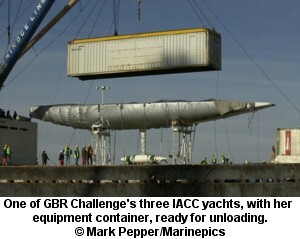 GBR 52 and GBR 44, formerly racing as Asura and Idaten for the Nippon Challenge, are the first 2000 vintage IACC yachts to arrive in Great Britain. They are complemented by GBR 41, built for the 1995 America’s Cup. The shipment also includes five support boats, four masts and seven 40ft sea freight containers carrying sails, rigging, masts, spars, spares and gym equipment. Double Olympic Silver medallist Ian Walker, Sailing Manager of GBR Challenge, has been as keen as Harrison to take delivery of the yachts and begin the strict training schedule that has been planned for the team. While it is important for the crew to make the most of the all the time they have to build on their skills, the foundations of working as a team will take time to acquire as they become familiar with the boats and sailing with each other. The syndicate shore team is currently preparing the yard for the boats’ arrival and the refurbishment of areas of the site that will see the necessary facilities installed. Already the administrative offices are operational, with the logistical arrangements well underway. ybw will follow the project from the inside, keep an eye on how the team is taking shape and post regular reports from the crew.